Drawing inspiration from the visions, strategies and conflicts that engendered the creation of Milton Keynes, as well as The Open University which was created at the same time and indelibly marks the history of the city, CLC 2018 will encompass the theme of regeneration. In all instances of regeneration are tensions between new and existing sociocultural visions and strategies, and the laws, regulations and forms of standardisation that seek to govern the pace and nature of regeneration in a given space and time. Equally there can often be a lack of legal attention and intervention where sometimes it is demanded, as well as forms of de-regulation that seek to attenuate the role and authority of law in favour of, for example, innovation. A full statement of the theme of CLC 2018 is available here. Download the new programme and proceedings document. This fee will include registration, lunches and a drinks reception on the evening of Thursday 6th September. In recognition of the costs of travelling from the global south, we are extending the reduced rate to those coming from LSA's Category 2 and 3 economies. The conference dinner will be held on site at The Open University Walton Hall campus. Tickets for this are included in those conference tickets that specify the conference dinner. You are welcome to bring partners/guests to the conference dinner if you purchase a separate dinner ticket for them. If you are a postgraduate student and wish to attend the pre-conference doctoral workshop on the afternoon of 5th September, please ensure that you register for a free doctoral workshop ticket in addition to your main conference ticket. The following plenary sessions and speakers have so far been confirmed. More information will follow shortly. Margaret Davies is Matthew Flinders Distinguished Professor at Flinders University. She is a Fellow of the Academy of Social Sciences in Australia, Fellow of the Australian Academy of Law, and author of five books on legal theory and the philosophy of property. Her latest book is Law Unlimited: Materialism, Pluralism, and Legal Theory (2017). Is Posthumanism the Last ‘Post’? Regenerating Law Beyond the Human Subject The 20th century was an era in which a number of ideological ‘-isms’ reached peak intensity. However, it was also an era in which these movements began to show their flaws and to break down. In the second half of the century this resulted in the enthusiastic deployment of a terminology in which things become problematised, placed into the past, and are yet understood to have a powerful continuing influence: thus, we have a ‘post’ prefix attached to all manner of theoretical and institutional forms. Posthumanism pushes this logic to its extremity beyond human subjectivity and knowledge. It removes the origin of being and of cognition from the individual self, and allows us to see the self as epiphenomenal, an effect or symptom of the innumerable and complex interactions between body, environment, and other subjectivities. Posthumanism can be understood as both posthuman-ism and post-humanism. In other words, it critiques both the separated ontological and biological status of the human as well as the human-centred world view promoted by the scholarly and cultural traditions of humanism. Posthumanism has recently provided a point of departure for a critical questioning and regeneration of concepts of law, which I will consider in this paper. What are the new modalities of understanding the legal world that start from the interactions between subjects and material objects, and the intra-actions which bring them into being in the first place? What are the possibilities for developing a theoretical approach to law in which concepts are attuned to the dynamics of making and re-making subjects and objects, abstractions and matter? What becomes of ‘law’ itself in such a conception? Rebecca Coleman is Reader in the Sociology Department, Goldsmiths, University of London, where she researches and teaches across sociology, media and cultural studies and feminist theory on topics including futures and presents, bodies, affect and inventive methodologies. She is currently working on two projects related to temporality. The first is a book on glitter, which explores the temporal politics of this ubiquitous material. The second is a project, ‘Mediating Presents: Producing “the Now” in Contemporary Digital Culture’, supported by a Leverhulme Research Fellowship (2018-19), which examines how the present is stretched and condensed via engagements with different digital media. Regeneration and Temporal Politics: On ‘Re’s and ‘Pre’s Taking inspiration from Massey’s understanding of space as ‘always in the process of being made. It is never finished, never closed’ (2005: 9), this paper explores some of the temporal politics of regeneration. Rather than focus on regeneration as an urban project, the paper instead develops a conceptual approach to ‘regeneration’ as a term, examining in particular its temporalities. It first considers the future-orientation of regeneration, suggesting that ‘generation’ implies a creativity and inventiveness that is inclined towards novelty and the future: an open-ended and processual becoming. It then, second, considers the prefix ‘re’, highlighting various meanings and emphases of ‘re’, including processes concerned with creating anew (e.g. reactivate, revolution), with going back (e.g. returning) and being behind or after (e.g. remaining). These uses of ‘re’ point to a multiplicity of temporal processes that are oriented both to the future and past. They thus bring temporal complexity and diversity to an understanding of (re)generation, which may be found, for example, in debates about the regeneration of specific places and things (how far they change its feel, make up and direction). Third, the paper examines further the multiplicity and diversity of the possible temporalities of (re)generation by discussing recent theories of media, affect and temporality on ‘pre-emergence’, ‘prehension’, ‘pre-emption’ and ‘premediation’, It considers what supplementing the prefix ‘re’ with ‘pre’ might do to understandings of (re)generation. It argues that a concept of pregeneration seeks to capture and make sense of a kind of ‘just-beforeness’, where the future (and past) is brought into the present, and how this specific set of temporal relations is becoming increasingly important to contemporary politics. It sees these temporal relations as placing emphasis on the suppleness and activity of the present, and it reflects on what might be at stake, theoretically and politically, in focusing on the presents implied by pregeneration. Discussants: Lucy Finchett-Maddock (Sussex), Sarah Keenan (Birkbeck), and Andreas Philippopoulos-Mihalopoulos (Westminster). Throughout her life, Doreen Massey was deeply committed to geography. In her hands, geography was more than an academic endeavour. She saw it as a way of creating new ways to understand, and to do, politics. The roundtable will aim to inspire discussion and debate on the key themes and connections that lay at the heart of the late Professor Massey’s critical body of work, such as relationality, space, and neoliberalism. Featuring the film Milton Keynes of the Mind: Looking for Culture Through Economy by Sapphire Goss, the plenary session will delve into the cultural history of Milton Keynes through the lens of the Journal of Cultural Economy and in particular its links to the work of Stuart Hall, leading cultural theorist and sociologist, and former Head of the Sociology Department at the Open University. The session will be hosted by the editor of the journal, contributor to the film, and Senior Lecturer of Sociology at the Open University, Liz McFall, who will lead discussion. Ahead of the plenary attendees may want to read the accompanying article On brutal culture by Darren Umney, Taylor C. Nelms, Dave O’Brien, Fabian Muniesa, Liz Moor, Liz McFall, Melinda Cooper and Peter Campbell. A postgraduate workshop will take place prior to the start of the conference, from 2-5pm on Wednesday 5th September 2018. Visit the webpage for more details. Delegates should make their own arrangements for accommodation. 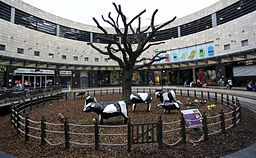 The Hilton Milton Keynes and Kents Hill Park are a short walk from The Open University.